The Electromotive Force is the measure of the energy supply to each coulomb of charge. The EMF is generated by the electrochemical cell, dynamo, photodiodes etc. Electromotive Force is a measurement of the energy that causes current to flow through a circuit. It can also be defined as the potential difference in charge between two points in a circuit. It is also known as voltage and it is measured in volts. It is a measurement of energy per unit charge. The EMF stands for the electromotive force. It is measured in volts and represented by the symbol E.
Electromotive Force (E) = I (R + r). r = Internal Resistance of the circuit. R = External Resistance of the circuit. How to find the Electromotive Force? Problem: A cell in a deaf aid supplies a current of 25 mA through a resistance of 400Ω. When the wearer turns up the volume, the resistance is change to 100Ω and the current rises to60 mA. 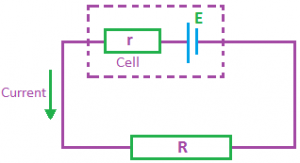 What is the EMF and Internal Resistance of the cell? Therefore, Internal Resistance (r) = 114.3 Ω.
E = 25 x 10⁻³ (400 + 114.3) = 12.857 ≈ 12.86 Volts.